The Union Home Minister Shri Rajnath Singh inaugurated the hugely popular Hornbill Festival 2018 in Kohima today, coinciding with the Formation Day of Nagaland. Addressing the gathering, the Union Minister said that the annual Hornbill Festival is a spectacular event showcasing the rich ancient culture and civilization of the people of Nagaland. It powerfully demonstrates the cultural diversity and civilizational unity of the people. “How each tribe is proudly unique, their cultural richness and yet there is an overwhelming sense of unity among all. This spectacular demonstration of unity in diversity in what India is all about. At the Hornbill Festival I get a glimpse of the Indian spirit of happy peaceful coexistence of the multiplicities,” he said. Shri Rajnath Singh mentioned his visit to the Hornbill Festival last year and said he was so overwhelmed with the celebration that he felt compelled to attend this festival again this year also. Expressing his gratitude to the Government of Nagaland for expanding similar festivals to other parts of the State where mini-Hornbill Festivals are celebrated from time to time, Shri Rajnath Singh said it will vastly enhance the popular participation in it and enlarge the arc of happiness. Home Minister thanked the State Government for initiating such events in other parts of India including the national capital. “That will help the countrymen to understand the cultural richness of the Nagas. Folk songs and dances are essential ingredients of the traditional Naga culture. Tradition is kept alive through songs and folk tales and very often romantic and historical themes are sung and stories of famous ancestors told. Seasonal songs, which describe various activities done in a particular agricultural season and war dances are also an intrinsic art form in Nagaland,” he said. Home Minister said Hornbill Festival offers unique opportunity not only to the different tribes of the State to interact with each other and exhibit their cultural heritage but also with those from the neighbouring and other States in the true spirit of “Ek Bharat, Shrestha Bharat”. Given the rich cultural heritage of Nagaland, Government of India has established the North Eastern Zonal Cultural Centre at Dimapur, Nagaland. The North Eastern Council (NEC) has also funded the infrastructure for the Margaret Shikshak School of Music at Patkai Christian College, Dimapur. “You all will be happy to learn that NEC is building a North Eastern Cultural and Information Centre in Delhi. The proposed centre would showcase rich history, culture, heritage and cuisine of the eight States in the North East. It will also establish facilities for promotion of tourism, a Common Facility Centre, Library, Knowledge and Resource Centre in the National Capital. This Centre would facilitate dissemination of knowledge about the rich cultural heritage of the North East,” said Shri Rajnath Singh. The Union Home Minister mentioned the importance of how the powerful forces of modern technology, economy and trade are shaping the new world and the new world order. “Old templates of geopolitics are crumbling to the emerging new and somewhat uncertain templates of geo-economics, largely driven by modern technologies. Even the old political ideas and beliefs are being given new meaning by these forces of change,” he said. 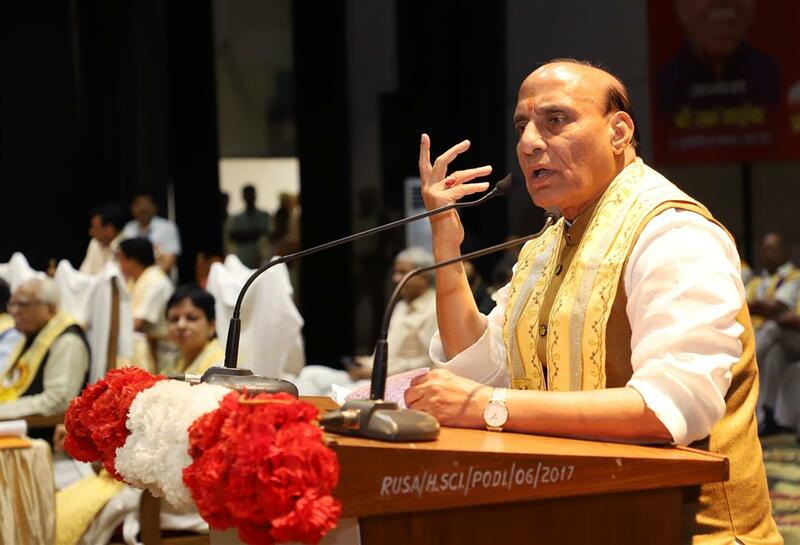 Shri Rajnath Singh said that the forces of change are inevitable and will not wait for anyone. “We have to be prepared for it. If we are prepared for it, we will shape the future according to our wish. If we are not prepared for it, we will be shaped by these forces, may be even against our wish. The challenge of the day is to grasp and master these forces. India is geared to grasp and master these forces. The main driver of this is our youth. Our challenge is to make them capable enough to be the master of our better tomorrow. Nearly half the Indian population is young. Similar is the demographic profile of Nagaland. While we are all rightly proud of our rich and glorious past, we also have to create conditions conducive for our rich future. Nearly 50% of Nagaland population is below 25 years. It is they who will shape the future of India including the future of Nagaland. We have to create conditions where their creative and entrepreneurial potential is unleashed to the optimum,” he said. Expressing his happiness that Nagaland State is going to get its first Medical College under Ministry of Health and Family Welfare, the Home Minister said Rs. 300 crores has been sanctioned for this purpose. NEC has also funded setting up of a North East Regional Multi Disciplinary Paramedical Institute, Dimapur at a cost of about Rs. 50 crores. Besides, over the years Government of India has executed a large number of other projects in Nagaland leading to the path of faster and all-round development of the state. “While we must celebrate the past at the Hornbill, we should also celebrate the present and the future with several festivals of skills and creativity of our youth. Nagaland is geographically located at a vantage point. It is the gateway to the South-East Asia. North-East is the pivot of our Government’s ‘Act East’ policy. Today, we are at the best of relations with our neighbour Myanmar. On the bedrock of our shared cultural and civilizational linkages with Myanmar, we have also a large spectrum of shared interests. Government of India is determined to build and improve our connectivity and engagement with South-East Asia. Today, India and ASEAN are partners in growth. The story of this growth will be written by our youths of the North-East region. Central government has opened a bright new chapter in the growth story of North-East region. It is heartening to know that development of a four-lane road, the main artery from Dimapur to the State Capital Kohima, which was promised by the then Prime Minister Shri Atal Bihari Vajpayee ji, is in full swing and it will be completed soon. With remarkable restoration of peace, North-East is emerging as a favoured destination of businesses and tourists. I am happy to know that the police and the tourism department of Nagaland Government have started the Tourist Police. I am sure it will help lift Nagaland to another level where visitors from outside will go back with a lot of happy stories of the state and the region,” said Shri Rajnath Singh. The Union Home Minister further said that for the last few years, India is making faster progress in all socioeconomic sectors and the country has emerged as the fastest growing major economy in the world with the current ranking being sixth. “We are expected to be one of the top three economic powers of the world in next 10-15 years. India has recently overtaken the economy of France and is soon expecting to exceed the GDP of United Kingdom. Government of India has taken various initiatives to further accelerate the economic growth,” said Shri Rajnath Singh. “Steps are also being taken for speedier development of North-Eastern Region, including Nagaland. We believe that nation can prosper only when all the States develop at a faster pace. Nagaland has suffered for a long time. On the 56th Anniversary of the State, I call upon all my friends of this State to take long strides for the rapid economic growth of the country as well as that of Nagaland and make all of us proud Indians to be contributors in making India a world power. As we celebrate Christmas in a few weeks and march on to the New Year 2019, I wish it brings lasting peace as well as an opportunity to let the past behind and look forward for a brighter future that would help all young Naga boys and girls realize their aspirations of a better life,” he added.